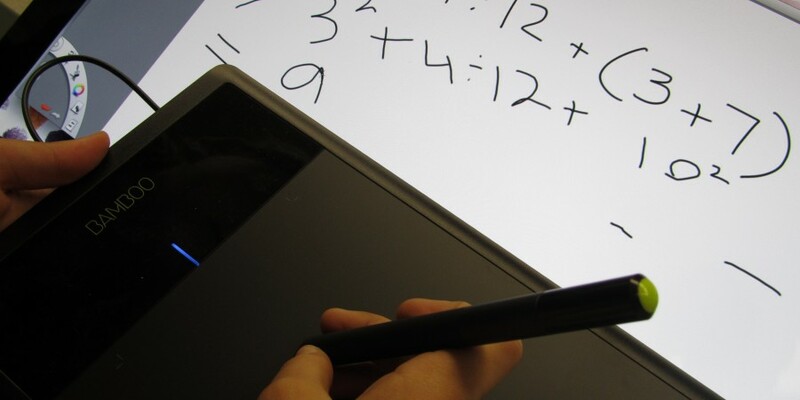 In my picture, you see a student working on math syntax using a digital tablet. This year my class used these tablets and our computers to make a LOT of how to films for math. You can see these videos on our YouTube Channel, Curiosity Films. You can also find them on the California Math Demonstration Center’s website. You might say we’re famous for our math work. I think technology is a good resource to use when learning, because it keeps kids like me entertained. When I am entertained it makes me want to learn more, because I learn using really cool technology. When I work on worksheets sitting in my desk my attention drifts, because I’m not having as much fun as I could be making films and using technology to learn. When a teacher explains a mathematical subject to me and just gives me homework about it, I don’t learn. But when I have to teach that mathematical subject to our YouTube viewers by making a film about it, I find I’m actually understanding it even better…and I’m having fun at the same time!